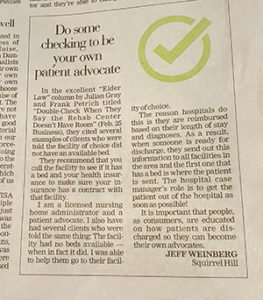 We made the editorial page of the Post Gazette discussing how hospitals discharge patients, and why you don’t get the facility you want. Take a look below! And if we can help with your patient advocacy in any way, please contact us. In the excellent article written by Julian Grey and Frank Petrich titled “Double-Check when they say the rehab center doesn’t have room”; They cited several examples of clients who were told the facility of choice did not have an available bed. They recommend that you call the facility to see if they have a bed or not and your health insurance to make sure your insurance has a contract with that facility. I am a licensed nursing home administrator and a patient advocate. I also have had several clients that were told the same thing: The facility had no beds available when in fact they did. I was able to help them go to the facility of choice. The reason hospitals do this is they are reimbursed based on their length of stay and diagnoses. As a result, when someone is ready for discharge they send out this information to all facilities in the area and the first one who has a bed is where the patient is sent. The hospital case manager’s role is to get the patient out of the hospital as soon as possible! It is important, as a consumer that you are educated on how patients are discharged so you can become your own advocate.